For the Harry Potter character, see Ministry officials in Harry Potter § John Dawlish. 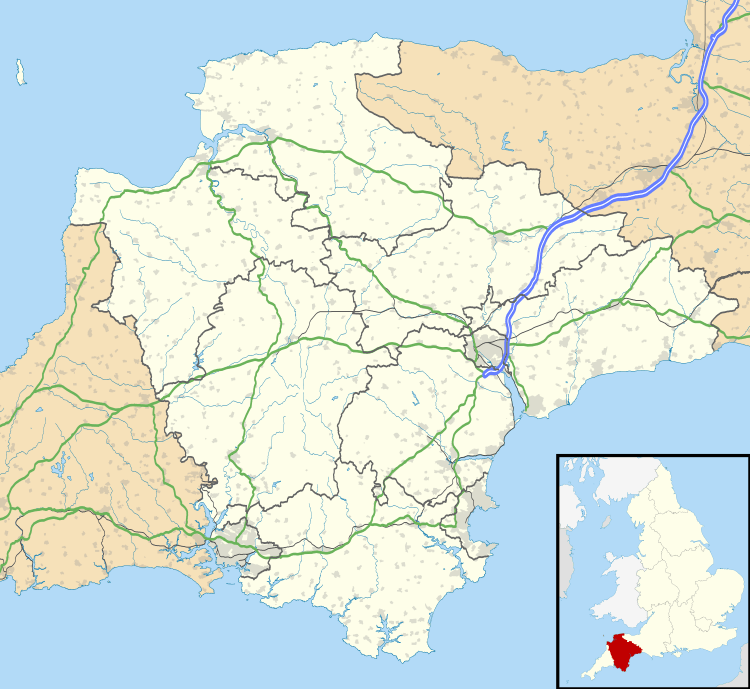 Dawlish /ˈdɔːlɪʃ/ is a town and civil parish in Teignbridge on the south coast of Devon in England, 12 miles (19 km) from the county town of Exeter. It has a population of 12,819, decreasing to 11,312 at the 2011 census. During the 18th century, it grew from a small fishing port to become a well-known seaside resort. Dawlish has two electoral wards (Central & North East + South West). Their combined population at the 2011 census was 13,161. Dawlish is located at the outlet of a small river, Dawlish Water (also called The Brook), between Permian red sandstone cliffs, and is fronted by a sandy beach with the South Devon Railway sea wall and the Riviera Line railway above. Behind this is a central public park, The Lawn, through which Dawlish Water flows. Immediately to the south-west of Dawlish is a headland, Lea Mount, with Boat Cove at its foot and Coryton Cove, the furthest part of the beach accessible by the seawall path, behind it. To the north-east, via the beach or seawall, the coast can be followed some 2 km to Langstone Rock and the resort of Dawlish Warren beyond, although this path is blocked at extreme high water. Dawlish is also known for its black swans (Cygnus atratus), introduced from Western Australia, which live with other exotic waterfowl in a small urban sanctuary on Dawlish Water. The name Dawlish derives from a Welsh river name meaning black stream. There was also a Roman translation of Dolfisc, meaning 'Dark river' and 'The Devils Water'. It was first recorded in 1044 as Doflisc. By 1086 it was Dovles; in 1302, Dovelish; and by 1468 it had become the more recognisable Dawlisshe. Before Dawlish itself was settled, fishermen and salt makers came down from the higher ground where they lived, to take advantage of the natural resources available on the coast hereabouts. They built salterns to produce salt and stored it in sheds nearby. The unpredictable nature of the stream, Dawlish Water, during floods is likely to have led to nearby Teignmouth being the preferred site for salt-making, and the practice stopped at Dawlish during the Anglo-Saxon period (AD 400–1000). The earliest settlement at Dawlish grew up almost a mile away from the coast, around the area where the parish church is today. There is evidence of early settlements at Aller Farm, Smallacombe, Lidwell and at Higher and Lower Southwood, where the ground would have been fertile and not subject to flooding. The land that includes present-day Dawlish was granted by Edward the Confessor to Leofric, later the first Bishop of Exeter, in 1044. After the Norman Conquest, Leofric gave the land to the Diocese of Exeter, which held it until it was sold, in 1802. Little of note happened at Dawlish until the end of the 18th century, when seaside locations on the south coast started to become popular with the wealthy, mainly caused by George III making Weymouth in Dorset his summer holiday residence from 1789. In May 1795, the antiquarian and topographer John Swete spent some time in Dawlish and reported that although not long ago it had been no more than a fishing village, and the best lodging house would not cost more than half a guinea per week, it was now so fashionable that "in the height of the season, not a house of the least consequence is to be hired for less than two guineas a week, and many of them rise to so high a sum as four or five." In the first decade of the 19th century the land between the original settlement and the sea was "landscaped"; the stream was straightened, small waterfalls were built into it, and it was flanked by a broad lawn and rows of new houses: The Strand on the north side and Brunswick Place on the south. The entire layout survives remarkably unchanged today, despite severe damage caused by a torrent of water coming down Dawlish Water from the Haldon Hills on the night of 10 November 1810. Also worth noting are Manor House and Brook House (both about 1800) and some of the cottages in Old Town Street surviving from the old village. Dawlish's transformation from a fishing settlement to a watering hole for Victorian celebrities is documented at the Dawlish Museum. View of Dawlish beach May 1881. In 1830, Isambard Kingdom Brunel designed a railway, which operated on a pneumatic principle using a 15-inch iron tube. One of the pumping stations was in this town. The line ran right along the sea-front of the town, but Brunel ensured that the line was carried across the mouth of the stream on a small granite viaduct, leaving access to the beach. The atmospheric railway opened on 30 May 1846 and ran between Exeter St. Davids and Newton Abbot. The first passenger train ran in September 1847, but the project was besieged with problems mainly with the leather sealing valve, which after 12 months of use needed replacing at a cost of £25,000. South Devon Railway directors abandoned the project in favour of conventional trains: the last atmospheric train ran in September 1848. After visiting Sidmouth in 1801, Jane Austen spent a long holiday at Dawlish in 1802, later complaining about its "particularly pitiful and wretched library". She mentioned the town several times in her 1811 novel Sense and Sensibility. In Charles Dickens' Nicholas Nickleby (1838–39) the protagonist inherits a small farm near Dawlish. The novelist and poet Margaret Holford died in Dawlish on 11 September 1852, aged 84. View from Dawlish station to the south-west toward the scenic tunnelled coastal section of line. Dawlish railway station is situated in the town centre next to the beach. It is served by trains to most stations in Devon, and to London and further afield. The line is noted as one of the most memorable stretches of track in Britain for its natural beauty, although at a very high cost to Network Rail as it is one of the most expensive lines to maintain due to the continual battle with sea erosion. One storm in 1974 washed away much of the down platform in the station, and during the UK storms of January–February 2014 waves brought down the sea wall and washed away a section of the railway line leaving the permanent way suspended in mid air. The 2014 storm raised questions about the vulnerability of the South Devon Railway sea wall to storm damage and proposals were put forward to re-route Plymouth-bound rail services further inland, either by re-opening the disused railway line via Okehampton and Tavistock, re-opening the former Teign Valley Line, or by reviving a 1930s GWR project to construct the Dawlish Avoiding Line. The A379 road runs through the town parallel to the railway line. During the early and middle part of the 20th century, Dawlish became famous for Devon Violets perfume, and hundreds of varieties were grown in market gardens surrounding the town. Violet escapees can be found growing wild across the area. Lately the town has become known for growing freesias, daffodils and strawberries. The sheltered location in Lyme Bay means the climate is mild and frost/snow are rare, ensuring a long growing season. Television presenter Phillip Schofield once remarked that Dawlish's growing season was the 16th best in western Europe. There are several schools in Dawlish. Gatehouse Primary School is one of them Westcliff Primary is another, Ratcliff School and Oaklands Park School. DCC (Dawlish Community College (Formally known as Dawlish Comprehensive School, And Dawlish Secondary Modern)) is the popular 'Secondary' In the Area on Elm Grove Road. Oakwood Court College is a specialist residential college based in Dawlish with another satellite college in Torpoint. Dawlish is twinned with Carhaix-Plouguer in France. ↑ "Town population 2011". Retrieved 18 February 2015. ↑ "Dawlish Central & North East ward 2011". Retrieved 18 February 2015. ↑ "Dawlish South West ward". Retrieved 18 February 2015. ↑ Watts, Victor (2010). The Cambridge Dictionary of English Place-names (1st paperback ed.). Cambridge University Press. p. 180. ISBN 978-0-521-16855-7. 1 2 "Dawlish History Introduction". dawlish.com. Retrieved 17 June 2012. 1 2 3 Hoskins, W. G. (1972). A New Survey of England: Devon (New ed.). London: Collins. pp. 386–7. ISBN 0-7153-5577-5. 1 2 3 Worth, R. N. (1895). A History of Devonshire. London: Elliot Stock. pp. 314–5. ↑ Peter Hunt, ed. (1984). Devon's Age of Elegance. Devon Books. p. 128. ISBN 0-86114-750-2. ↑ Cherry, Bridget; Pevsner, Nikolaus (1989). The Buildings of England – Devon. Harmondsworth: Penguin. pp. 329–333. ISBN 0-14-071050-7. ↑ Hadfield, Charles (1967). Atmospheric Railways (First ed.). David & Charles. ISBN 0-7153-4107-3. ↑ "Jane Austen ... Dawlish and Sidmouth" (PDF). Devon Libraries. Retrieved 17 June 2012. ↑ "Jane Austen Gazetteer - Sense and Sensibility - Dawlish, Devonshire". The Republic of Pemberley. Retrieved 17 June 2012. ↑ "Railway cliff scheme 'on target'". BBC News. 13 October 2004. Retrieved 31 March 2008. ↑ "Weather could wash away rail link". BBC News. 27 October 2005. Retrieved 31 March 2008. ↑ Chris Ledgard (27 May 2006). "Brunel railway faces up to the sea". BBC News. Retrieved 31 March 2008. ↑ Kay, Peter (1991). Exeter - Newton Abbot: A Railway History. Platform 5. p. 108. ISBN 1-872524-42-7. ↑ "Dawlish railway repairs halted over safety fears". BBC News. 13 October 2004. Retrieved 31 March 2008. ↑ "UK storms wash away railway line and leave thousands without power". BBC News. Retrieved 5 February 2014. ↑ Turner, Lauren (7 February 2014). "How do you fix the Dawlish problem?". BBC News. Retrieved 8 February 2014. ↑ "British Towns Twinned with French Towns". Complete France. Retrieved 4 July 2016. Wikimedia Commons has media related to Dawlish.